Check out our Spring Events Calendar for a full listing of upcoming events, and make sure to follow us on Facebook to stay updated! A Distinguished and Presidential Professor of English and American Studies at the Graduate Center of the City University of New York, Robert Fitzgerald Reid-Pharr holds a Ph.D. in American Studies and an M.A. in African American Studies from Yale University and a B.A. in Political Science from the University of North Carolina at Chapel Hill. 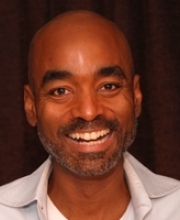 A specialist in African American culture and a prominent scholar in the field of race and sexuality studies, Reid-Pharr has published three books: Conjugal Union: The Body, the House, and the Black American (Oxford University Press, 1999); Black, Gay, Man: Essays (NYU Press, 2001); and Once You Go Black: Choice, Desire, and the Black American Intellectual (NYU Press, 2007). His essays have appeared in, among other places, American Literature, American Literary History, Callaloo, Afterimage, Small Axe, The Chronicle of Higher Education, Women and Performance, Social Text, Transition, Studies in the Novel, The African American Review, Feminist Formations, Art in America, and Radical America. Robert Reid-Pharr's book, Archives of Flesh: African America, Spain, and Post-Humanist Critique, will be available for purchase and signing. Light fare and refreshments will be served following the lecture. COLLOQUIUM: "Archives of Flesh: African America, Spain, and Post-Humanist Critique"
Robert Reid-Pharr is the recipient of a 2016 John Simon Guggenheim Memorial Foundation Fellowship for his work, Archives of Flesh: African America, Spain, and Post-Humanist Critique, from which he will be reading during this colloquium. You can access the reading on our webisite here or you may request the reading by emailing humctr@pitt.edu. 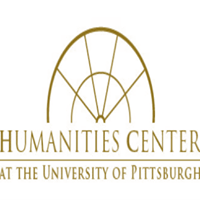 Faculty and graduate students in Pitt Humanities departments can access colloquium papers two weeks before events by logging in to my.pitt.edu, then going to "My Resources Humanities Center" then "Humanities Center". 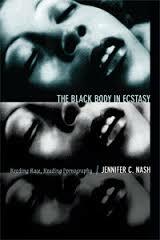 Prof. Nash will lead a faculty/grad colloquium on her book The Black Body in Ecstasy. Participants are encouraged to procure a copy of Prof. Nash's book and read in advance. This event is part of a cluster of spring term Gender, Sexuality, and Women's Studies Program events on intersectionality: Intersectionality Today. Sponsored by Gender, Sexuality, and Women’s Studies. 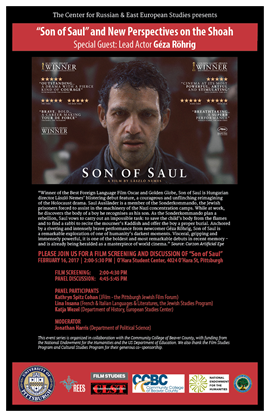 Cosponsored by the Humanities Center, the Depts. of Communication and Africana Studies, and the Year of Diversity. "Love Letter from a Critic, or Notes on the Intersectionality Wars" follows the word “critic” around the black feminist archive, endeavoring to trace its myriad meanings by asking: Who are intersectionality’s critics, and what precisely makes those scholars’ works critical? Why has the term “critic” come to circulate and proliferate around intersectionality in recent years? Why are black feminists so deeply invested in exposing the “critic”? In other words, the talk explores the affective lure of the term critic, engaging the variety of ways the term has become the centerpiece of the intersectionality wars that black feminism has found itself mired in, and asking how the constant invocation of the malicious critic as a pernicious outsider becomes a crucial strategy through which black feminists reassert their hold on intersectionality, and perform their collective desire to shield intersectionality from violent criticism. In place of entrenching black feminism’s territorial relationship with intersectionality, one which responds to the analytic’s centrality to women’s studies through asserting a proprietary claim to the analytic and guarding it from imagined outsiders, this talk asks what would happen if we – black feminists – considered intersectionality’s critics as figures who lovingly address us, who bring (rather than take), who generate (rather than destroy), who offer and participate in black feminism’s long-standing world-making project. The reading group in anticipation of the Spring Faculty Seminar, led by John Durham Peters, will meet on February 3rd from noon-1:30pm in 602 CL. 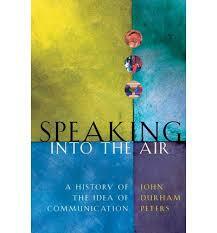 The discussion will focus on Peters’s book Speaking into the Air: A History of the Idea of Communication. Heonik Kwon is professorial Senior Research Fellow at Trinity College, University of Cambridge, and an APJ associate. The author of The Other Cold War, he co-authored North Korea: Beyond Charismatic Politics (Rowman & Littlefield, 2012) and is currently engaged in a five year international research project Beyond The Korean War, funded by the Korean Sciences Academy. 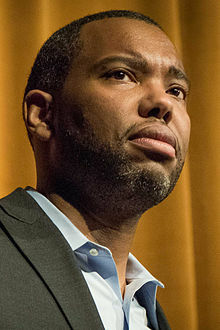 LECTURE: "Remembering the Cold War"
COLLOQUIUM: "Peace Under The Orange Tree: Civil War and The Amity of Kinship"
Ta-Nehisi Coates is the author of The Beautiful Struggle and Between the World and Me, which won the 2015 National Book Award, the PEN/Diamonstein-Spielvogel Award for the Art of the Essay, and was a finalist for the Book Critics Circle Award. A former writer for the Village Voice and a National Correspondent for The Atlantic, Coates has been awarded the Hillman Prize for Opinion and Analysis Journalism and the George Polk Award for his 2012 article “The Case for Reparations." He is the recipient of a 2015 MacArthur Fellowship, and was named one of TIME Magazine’s 100 Most Influential People in 2016. He recently wrote eleven issues of Marvel Comics's Black Panther series, which when it first appeared in the 1960s was the first comic book to feature a black superhero. As there is very limited space in the Humanities Center, at this time, this colloquium is only for invited guests. If additional space becomes available, we will open up RSVP's to the university and public on a first come, first serve basis. If you would like to add your name to the wait list, please email humctr@pitt.edu. LECTURE: "Pittsburgh Contemporary Writers Series Presents: Ta-Nehisi Coates"
Gioia’s many literary anthologies include Twentieth-Century American Poetry, 100 Great Poets of the English Language, The Longman Anthology of Short Fiction, Literature: An Introduction to Fiction, Poetry, Drama, and Writing, and Literature for Life. His poems, translations, essays, and reviews have appeared in many magazines including The New Yorker, The Atlantic, The Washington Post Book World, The New York Times Book Review, Slate, and The Hudson Review. Gioia has written three opera libretti and is an active translator of poetry from Latin, Italian, and German. LECTURE: "Dana Gioia at the 2nd Pittsburgh Humanities Festival"
This year’s visiting fellow and seminar leader, John Durham Peters, who will began a position as Professor of Film and Media Studies at Yale University in January of 2017, is A. Craig Baird Professor in the Department of Communication Studies at the University of Iowa, where he has taught for the past 30 years. An intellectual historian and philosopher of media and communication, Professor Peters has published books and essays on such varied topics as the history of communication research, the philosophy of technology, pragmatism, the public sphere, and media and religion. His first book, Speaking into the Air: A History of the Idea of Communication was published by the University of Chicago Press in 1999. The winner of the James A. Winans-Herbert A. Wichelns Memorial Award for Distinguished Scholarship in Rhetoric and Public Address from the National Communication Association, Speaking into the Air has been translated into eight different languages and earned Professor Peters wide recognition as an intellectual and cultural historian. His second book, Courting the Abyss: Free Speech and the Liberal Tradition, was published by University of Chicago Press in 2005. His most recent book, The Marvelous Clouds: Toward a Philosophy of Elemental Media, which explores a range of media infrastructures—from television transmitters to the sun—was published by the University of Chicago Press in 2015. If you are interested in participating in this seminar, please RSVP to the Humanities Center to confirm. Although all are welcome, these seminars have filled in the past, so an early confirmation is recommended to help guarantee your space in the seminar. We will hold a series of preparatory discussions through the spring term to begin conversation on its topics. Please address questions about the seminar to Brent Malin, the center’s Associate Director. Applications for the 2017-2018 Academic Year are due by Monday, January 30, 2017. The Humanities Center supports projects that foster research across departments or institutions, including conferences, lectures, and more, bringing together faculty from different departments and/or institutions through Faculty Collaborative Research Grants. We seek collaboration that enriches intellectual activity on campus and leads to results which can be specified. We do not grant funding support for the purchase of equipment or travel from Pitt's campus. To apply for the Faculty Collaborative Research Grant, please fill out and submit our online form. There is a second application deadline for the 2017-2018 year which is Monday, September 28, 2017, but it is in the best interest of the applicant to plan in advance, since funds may be more limited in September than in January. Applications must be received by 5 p.m. EST on February 13, 2017. The University of Pittsburgh Kenneth P. Dietrich School of Arts and Sciences is offering three postdoctoral fellowships in the humanities for the academic year 2016-2017. Fellows will teach one course each semester, complete scholarly work, and participate in the academic and intellectual communities of the departments with which they are affiliated and across the Dietrich School. Find out more about the Dietrich School Humanities Center Fellowship here. Applications must be received by 5 p.m. EST on February 13, 2017. Letters of recommendation must be received by 5 p.m. EST on February 20, 2017. No exceptions to deadlines are granted! Applications must be received by Friday, February 24, 2017. Please click here for a full description of this new Humanities Center Fellowship opportunity. Do you have an event that you'd like featured? Email the Humanities Center by Friday at 12pm for your chance for the event to appear in next week's edition! Public Talk: "To Conduct Strange Exercises on Barely Comparable Things"
What is at stake in the notion of interdisciplinarity? Does it seek a shared enterprise between fields of knowledge or methods of inquiry? Does it depend on a mastery of multiple disciplines? Or does it seek the limits of a discipline or its points of crisis? And who has the right or authority to approach these borders and fault lines of thought? Can we imagine the good, the bad, and the ugly of interdisciplinarity? By way of a reflection on time spent in and between the academic world and the museum world, I hope to explore the impetus and risk behind hybrid thinking and share current projects born of a new initiative at Carnegie Museums that seek to draw upon the intersections and interstices between the arts and sciences. Edith Doron serves as the Mellon/ACLS Public Fellow at the Carnegie Museums of Pittsburgh where she leads a new initiative called, Nexus, charged with creating collaborative, transdisciplinary opportunities across its four museums. Her professional background has straddled between the museum world and academia. After graduating with a degree in Comparative Literature and Biology from SUNY Binghamton, Doron served as the Cultural Program Specialist for the Brooklyn Children's Museum, and then as the Director of Programs at the Long Island Children's Museum. Her museum work evolved from collections-based teaching and exhibition development to launching an experimental series of cultural events by forging partnerships with diverse community based organizations. Philosophical inclination to the history of ideas led me to the Centre for Modern Thought at the University of Aberdeen in the UK. While teaching in the ‘Literature in a World Context’ degree program, she completed her MLitt by Research in 2008 with a thesis entitled, Of Things and Thresholds and continued to the PhD which she received in 2013, with Education and the Idea of Emancipation. Doron's current research is in the Anthropocene. She is working with a team of curators to develop an experimental cross-museum program series called, Strange Times: Earth in the Age of the In/Human. 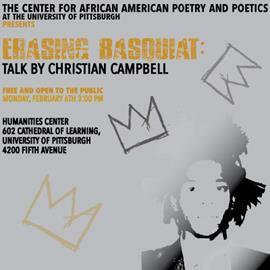 THE CENTER FOR AFRICAN AMERICAN POETRY AND POETICS AT THE UNIVERSITY OF PITTSBURGH PRESENTS: "Erasing Basquiat: Talk By Christian Campbell"
Christian Campbell is a poet, essayist, and cultural critic and the author of the widely acclaimed book Running the Dusk (Peepal Tree Press). His art writing on Jean-Michel Basquiat has been commissioned by the Art Gallery of Ontario, the Guggenheim Bilbao, Nahmad Contemporary, the Barbican Art Gallery, and the Schirn Kunsthalle Frankfurt. Call for Proposals: "Consuming Nature: Landscapes through the lens of the Anthropocene"
In Summer 2017, the History of Art and Architecture department is working with museums and galleries across Pittsburgh to present a one-week collection-based workshop for Pitt faculty and graduate students to explore visual and material cultures from the landscape tradition, as well as locations whose physical form have been shaped by shifting human attitudes towards nature and its management. - 10 participants receive $2,000 each to participate and develop research or community engagement projects. 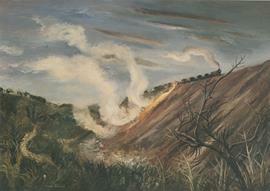 Presented as part of Collecting Knowledge Pittsburgh, supported by the Andrew W. Mellon Foundation. Sponsored by the Center for Russian and East Eurpoean Studies.